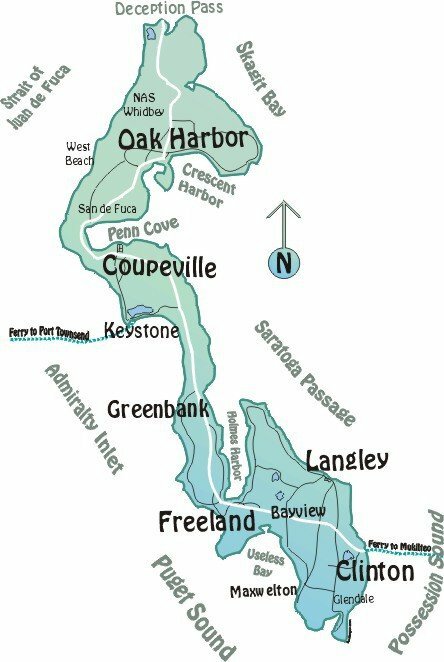 Here you’ll find Whidbey Island maps. You can scroll down for digital, online versions courtesy of google maps. 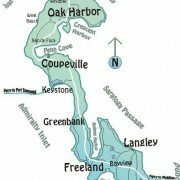 You can also use the buttons below to access printable Whidbey Island Maps in PDF format. You can print them for a quick and handy reference as you enjoy your Whidbey Island journey. Click the button below to view and print a basic island county map PDF. Click the button below to visit the Island County maps website directory. A specialty map detailing Whidbey island’s many different organic and sustainable farms. How did Whidbey Island Come to be? Whidbey Island is claimed to be one of the longest islands in the United States, though this really a difficult claim to prove based on the odd shape of Whidbey Island. Whidbey island is narrow and serpentine in shape. This was caused by massive glaciers melting and eroding huge swaths of earth as they receded during the last ice age about 14,000 years ago. The melting retreat of this so named Vashon Glaciation eroded the land, creating a drumlin field of hundreds of aligned drumlin hills. These glacial melts do not specifically “carve”, as in cutting into the landscape via the mechanics of ice/glaciers, but rather eroding the geology from glacial melt. As the ice retreated, vast amounts of glacial till were deposited throughout the Puget Sound region. The soils throughout Puget Sound which are less than 10,000 years old, are called immature by geological standards. The flow of these glacial melts is what caused the interesting, and sometimes confusing shape of Puget Sound and the eccentricities of it’s shoreline. It also accounts for the extreme depth of Puget Sound in relation to the width of it’s channels. This depth exceeds 1,000 feet in some areas. The great depth of Puget Sound is what allow for Seattle to be home to one of the busiest Ports in the world.